Are your existing points of sale (POS) performing at maximum capacity or is there still some room for improvement? Our models can map the full potential of every point of sale and every neighbourhood. We then compare this with their current performance and identify underutilised points of sale and regions. Finally, we search for the best way to turn them into absolute champions. Calculate the theoretical potential for every point of sale and neighbourhood, based on theoretical buyer flux models or historical performance. Compare this potential with recent effective performance to benchmark every store and every neighbourhood. Identify underutilised points of sale and POS with overcapacity as well as those that are underdeveloped. Identify areas that are underdeveloped. 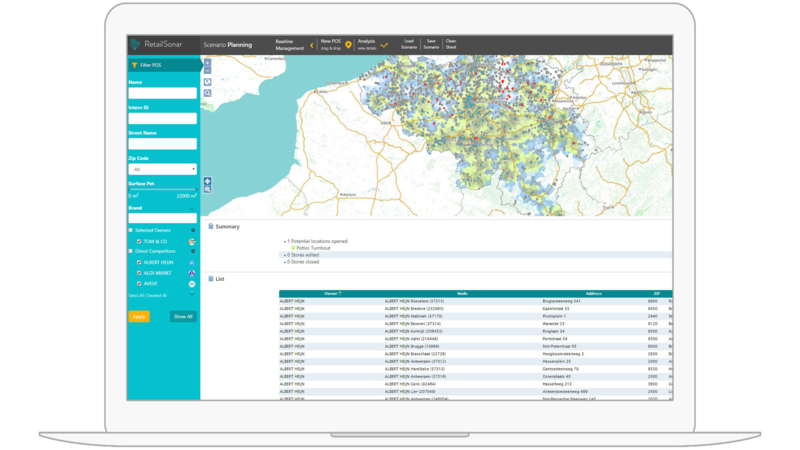 Explain the effective performance by mapping customer penetration, buying frequency and average receipt amounts. This enables us to understand what is the problem in underdeveloped points of sale. Take the right action for every point of sale to grow towards its theoretical potential. Organise in-store promotions to reverse low footfall and low receipt amounts. Decrease the capacity of points of sales that have insufficient potential to run at full capacity. We can determine the optimum staffing and layout of these points of sale with our queue models. Activate customers through specific marketing campaigns for underutilised points of sale. Activate underdeveloped areas with targeted marketing campaigns. Analyse the impact of every action you take through the RetailSonar platform. Periodically check the evolutions of the actual performance of every point of sale and for every neighbourhood. Evaluate which actions were a success and which weren’t. Use these insights to permanently optimise the potential of your points of sale. Additional marketing campaigns in regions with a substandard performance compared with the forecast sales figures. © 2019 RetailSonar. All Rights Reserved.